Mage Slayer can't be damaged by actions. 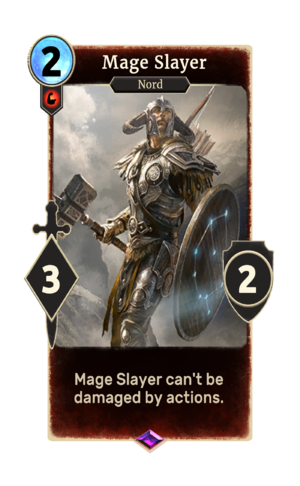 Mage Slayer is an epic Strength creature card. It is part of the Core Set. "Just tell me who needs bludgeoning." "I'm ready to split some skulls!" "The power is mine to wield!" The constellation depicted on the Mage Slayer's shield is The Atronach. This page was last modified on 13 February 2019, at 23:59.